We offer a selection of private, all day classes to introduce you to the art of blacksmithing. We provide all materials and tools needed. You will need to bring leather gloves that fit your hand. You can purchase a gift certificate to give a class to a friend! Visit the link to purchase a digital gift certificate (delivered immediately via email) or you can call or email to get a physical gift certificate (via postal mail, 3-5 business days after payment). Digital gift certificate payment is via credit/debit card through Square. If you wish to pay with PayPal or mailed check/money order you will need to contact me to purchase a physical gift certificate. Want to know what to expect in a class? One of the participants has created a 15-minute video of his experience at a 2-Day Workshop. Check it out on YouTube! This is an all-day class so plan 8-10 hours, though it could take more or less. We will work at your pace so the exact timing will vary. 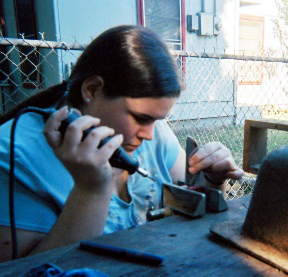 You will make a knife out of a railroad spike and finish it with a primitive-style finish. The blade will be hardened and tempered but not polished to a high sheen. These blades take 3-4 hours each, so plan your time according to your group size! This is an multi-day class, both days being 8-10 hours, though it could take more or less. We will work at your pace so the exact timing will vary. The karambit is a traditional Filipino hand scythe used for harvesting rice. 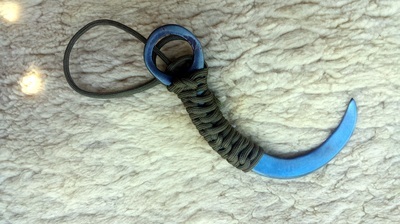 Modern Filipino martial arts (such as escrima, kali, or arnis) use the karambit. 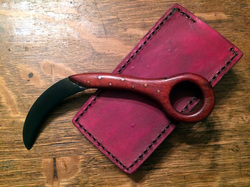 During the class you will forge the piece and finish it with a wooden or cord wrapped handle. We can also do general blacksmithing classes where you will work on small projects such as drawer pulls, grill tools, decorative items, etc. Typically you will make several small items during a class and you should contact me to discuss project options. Private classes are $150 for 1-2 people and run about 3 hours. Group classes are priced based on the number of people and run all day. Please contact me for more information. I want to buy a class as a gift, how do I schedule that? You can purchase a gift certificate! Visit the link to purchase an e-gift certificate or you can call or email to get a physical gift certificate. E-gift certificate payment is via credit/debit card. If you wish to pay with PayPal or mailed check/money order you will need to contact me to purchase a physical gift certificate. We prefer cash or check the day of the class. We can also take credit, debit or PayPal via invoiced pre-payment. We accept Mastercard, Visa, American Express, Discover, PayPal, Square Payment, personal check, money order, or cash. Your shop is too far away, can you come to me? Yes. Travel expenses will need to be added to the cost. Contact me for specific details or a quote on travel to your location. I want to bring more people/make more knives, can I? Maybe, but the cost may be different and the blade designs limited. Contact me with exact details of what you are wanting and we can work out the particulars. Bear in mind the time frames listed above and be aware that multiple days may be needed for larger groups. Yes, I do teach kids over the age of 10 with the caveat that they will need someone with them that can help out if needed. That could be you or another adult you designate OR it could be a friend their age as long as there is an adult with them. Starting around age 13 they usually have the stamina to do all the work but you will know your child best. Classes for children under the age of 10 may can be arranged on a case-by-case basis. Can you teach other classes? Yes! Just ask about what you want and I'll let you know what it would involve. Due to time constraints I typically don't teach sword making classes. (It can take weeks to months to make a sword!) But, if you want to invest the time and money, let me know and we can discuss it! What about classes in making Damascus? Due to the technical skill needed, I do not currently teach Damascus making to beginners. If you have some experience with blacksmithing or are a professional metalworker feel free to give me a call. I do not guarantee to teach you, but I am willing to discuss it! I am considering future courses but do not have a time frame in mind for implementing them.